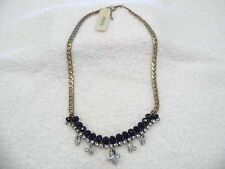 Fossil brand multi color stone necklace. See photos for details and measurements. I often use a nickel (7/8") to aid in color and sizing. Plain, Simple, and Easy! Fossil logo on large lobster claw closure. Beautiful Blue Faceted Beads on a Brown Heavy String that is adjustable. A Popular Fossil piece of Jewelry. Cord Strand Charm Necklace. Brown Cord, 17" long. Rainbow Moonstone Copper Wire Wrapped Pendant Gift Jewelry Shipped with USPS First Class Package. Features a shiny silvertone ring suspended from a classic chain. This is a Fossil brand Necklace with Semi Precious Stones. It is Silver Tone. MSRP $85. It is brand new with tags. This is a wonderful necklace. Free shipping. Please see my other listings for more great jewelry! Authentic Fossil Turquoise Teardrop Necklace. Fossil logo on chain next to teardrop. Stone Turquoise. Color: Turquoise. Material: Stainless Steele. 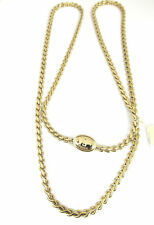 Total length of chain: 30". 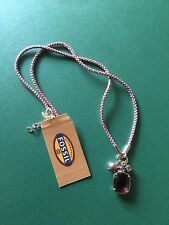 Sterling Silver.925 Stamped Lavish Fossil Coral, Amethyst and White Topaz Filigreed Pendant. 78x45mm width has big 30x20mm Rectangular Shaped Natural Coral. Look at details! Big filigreed horseshoe below Coral made for your good luck! Amazing piece of jewelry! Elegant and Beautiful! Thank you for choosing my jewelry. If you like their belts and accessories, you will love the jewelry. 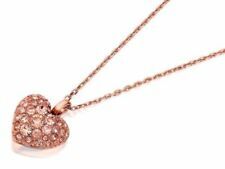 This great necklace can be worn alone or with charms added! Create your own unique look and change out the charms when your mood changes! THIS IS A GREAT FOSSIL FLY AWAY NECKLACE WITH SEMI PRECIOUS STONES. I DESCRIBE THEM TO THE BEST OF MY ABILITY AND FROM WHAT I KNOW. APPROXIMATE SIZE CONDITION: GREAT AS SHOWN, NEW NO WEAR . 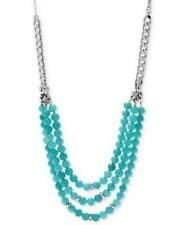 Infuse your style with a vibrant dose of effortless chic with this bold, beaded necklace from Fossil. Semi-precious teal-dyed jade beads. Item Specifics. 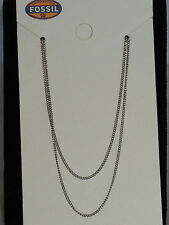 Fossil Silvertone Chain w/ Purple Jewel & 2 Charms Necklace. Color: Shiny silver-tone. Stainless Steel. Turquois tones in the large stone. With a bold pop of color, Fossil's teardrop pendant enlivens any look. Length: 18" 2"extender. Fossil logo embossed lobster claw style closure with logo heart lock, key and Fossil signature logo embossed stone. We are professionals, friendly and courteous and will treat you with the care and concern we value. I do my best to note the condition and if there are defects. -Everything MUST go! It has turquoise stone beads as well as other purple and pink beads. 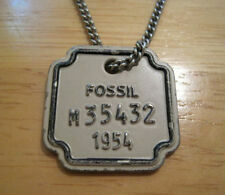 The clasp has the Fossil logo on it. 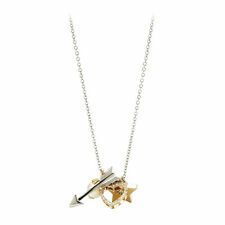 Hit the mark with this charming bow and arrow necklace from Fossil. Wear them together or separate -- it's the perfect gift to give to a friend. The Look:Polished steel bow and gold-tone arrow with grey crystals. Chain Circumference: 20 in. AND HANDLING. ARE UNUSED. This is a Beautiful Piece! Semi Precious Stones, and Beads with Stainless Steel, Beads and Chains. Many different colors and varieties of stones and beads give this necklace a one of a kind look with a Beautiful Teardrop Turquoise Pendant. Fossil Stone, Jasper, onyx and Glass seed beads pendant handmade by artist. Handmade preowned fossil pendant with Swarovski crystal beads, jasper, Czech glass, seed beads, gold plated beads, and onyx stones and brass/ gold plated metal. This beautiful pendant/pin has an off-white suede backing with seed beads sewn on it. You can see the beads in the photos.